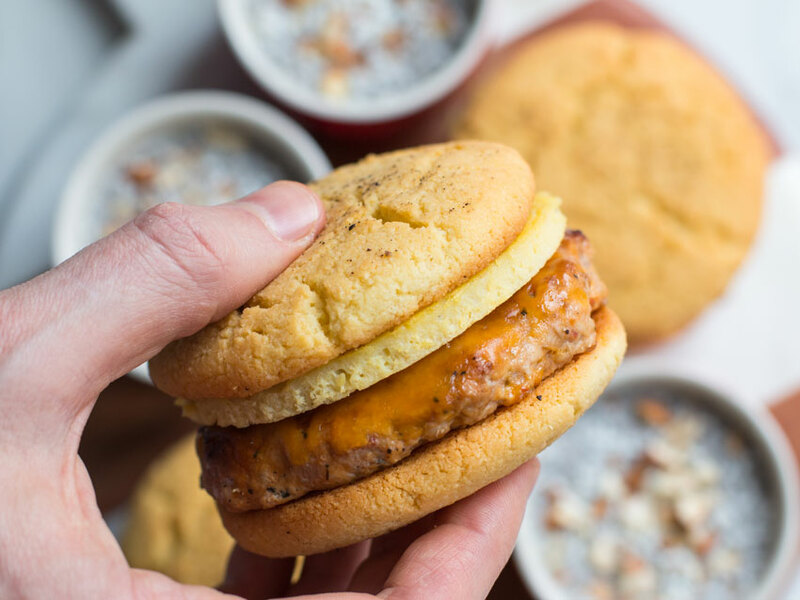 This low carb sausage McMuffin sandwich is the ultimate keto breakfast meal prep idea, especially when paired with my creamy chia seed pudding. The entire keto meal prep recipe will fill you up and start the day off right. You guys are always asking me for low carb breakfast ideas, so I thought I would put together a brekkie meal prep that was portable and so darn epic. This keto breakfast meal prep makes 5 servings of coconut chia seed pudding and 3 breakfast sandwiches. The almond flour biscuits make the perfect low carb bun (or English muffin) for these cute and tasty sandwiches. Keep in mind that cooked eggs can only stay in the fridge for 3 days, so feel free to freeze them and double up on the sausage McMuffin recipe. 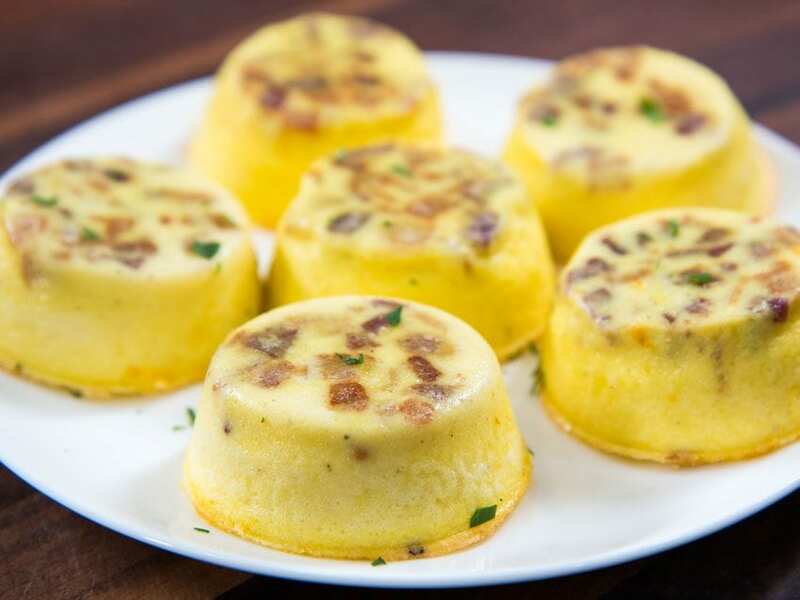 The combination of the low carb almond flour biscuit, juicy chicken patty covered in melted cheddar cheese, and eggs is the best healthy knock-off of McDonalds, plus the entire recipe is keto diet approved. 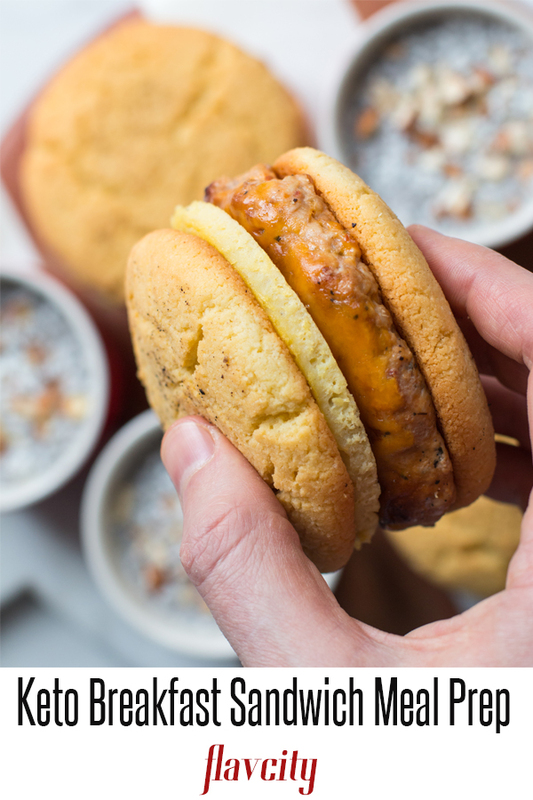 As if that were not enough, the keto breakfast sandwiches are paired with my creamy coconut chia seed pudding. The texture of these are silky and smooth! 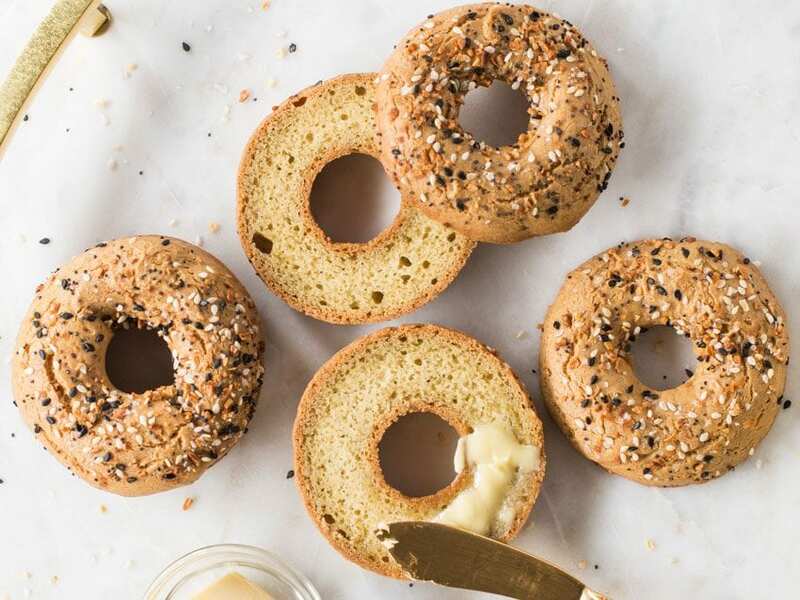 If you are looking for more keto breakfast ideas, then try my Starbuck’s egg bites and Dessi’s low carb keto bagels. I decided to make the ultimate version of McDonald’s sausage McMuffin sandwich by using ground chicken thighs to make the sausage patties. You can also use ground pork, but I wanted to mix it up, so I decided to use the pre-made sausages from Trader Joe’s, but you can make your own breakfast sausage spice rub by using fennel, chiles, and cumin. In fact, you can use my recipe here for Starbuck’s breakfast sandwich. I made my own spice blend for the pork. When making a breakfast meal prep sandwiches, you need to have cheddar cheese melt over the top, but I can’t stand cheese that does not melt all the way. Make sure to follow my instructions in the video and recipe post for adding an ice cube to the pan and closing the lid – the steam helps melt the cheese evenly. You can make 5 portions of the sausage patty for meal prep and keep them in the fridge for 5 days or freeze for 2-3 months. You can make sausage out of any ground meat. You just have to make sure to use spices that are typical for sausages like fennel, cumin, garlic, onion, and red pepper flakes. If you use those spices, you can make sausages from ground chicken, turkey, beef, lamb, and pork. Keep in mind that cooked eggs will only last in the fridge for 3 days, so if are prepping for breakfast, you can either freeze the cooked eggs or make more on day 3. The almond flour biscuits, chicken sausages, and chia seed pudding will all last in the fridge for 5 days, so by freezing some of the eggs, you can cook once and have 5 breakfast meals done. The best way to reheat the sandwiches is in a 350 degree F oven for 7-10 minutes or you can quickly microwave them, making sure not to overheat. This low carb breakfast meal prep has the most incredible keto sausage McMuffin sandwiches paired with creamy coconut chia seed pudding. Your instructions for the biscuits leave out when to add the baking powder. Don’t think they will turn tour right but hopefully they are still tasty. 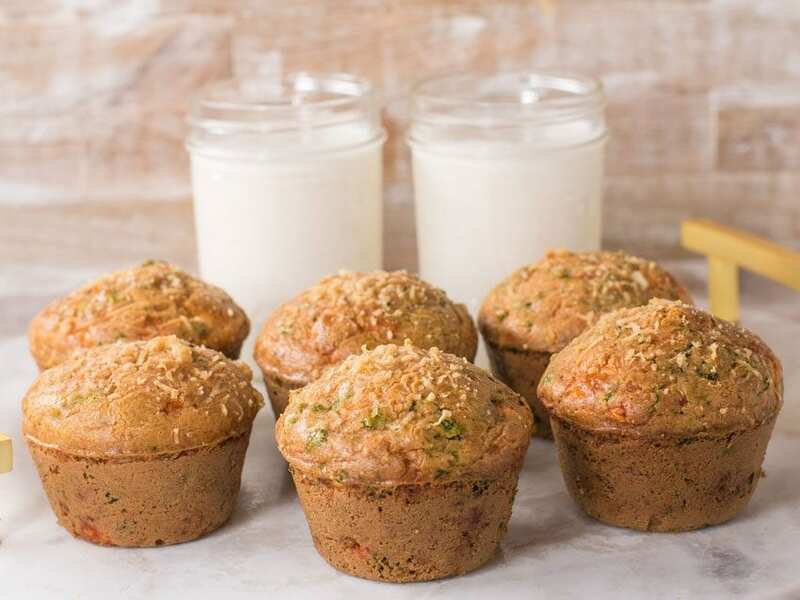 Can you substitute the almond flour with cassava flour? Hi there. Just made this bread this morning. I can’t tell you how delicious this is! I won’t miss eating bread. Your YouTube page gives clear direction step by step. Thank you so much…..
We love to hear that Joy!!! I haven’t tried any of your recipes yet, but they all sound delish!! Will certainly try them very soon! They will certainly help us stay on the keto diet due to much variety! I’m so happy I came upon your website on google! Going to check out your you tube’s as well! Whoa…genius alert!! That is awesome Nina..so glad you rocked the recipe! This breakfast was OMG amazing! Even my non kept family loved it. I love your recipes, tips and humor. Thanks for helping me stay kept strong. Love your web site for the easy and delicious food. That is fantastic to hear! Keto does not mean you have to eat bland food, everyone in the family can enjoy it! My first try at keto anything and it is ok. My question is is it possible to get rid of the aftertaste on the buscuit or is that normal? i did not know there was an aftertaste?? its just almond flour and fat!? Immediately. I am not trying to complain I just spend alot of money and want this to work out. I also am a bit confused on the pudding. I followed the instructions but the puddi g the next morning was like seeded milk. How do you make it set like pudding? I had to drink it from the bowl and it was very tasty. And yes I whisked 3 times at 10 minute intervals and put in fridge sealed overnite. Should I try more seeds next time? Any advise would great. thats odd if you whisked it well, try adding 2 tablespoons more of chia seeds! I dont have that issue with the biscuits, def. not an after taste…weird? I ran into a similar problem as the user Jessica above. The recipe calls for ‘full fat coconut milk’, but as I’ve never cooked wwith any kind of coconut milk I was unsure on what to purchase (the kind of coconut milk that you can drink or the thicker, yogurt like coconut milk in a can). Hi Luke, you want to go for the one in the can. They come in full fat or reduced fat. The full fat one is pretty thick. Excellent. Thanks for the response Bobby! Hey guys! 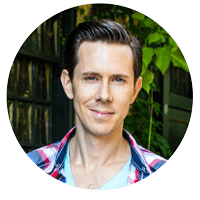 I’m really new to keto/low carb eating and I just found your videos on Youtube last week. I’m happy to say that I’ve already made this dish. The only thing I did differently was that I made Maple Chicken breakfast sausage from another recipe I found online rather use the store bought. My wife was shocked that I actually made the biscuits. Great recipe, perfect breakfast and very very tasty. I’ll be making the Chicken Salad & Cloud Bread dish next. Can’t wait to try it out. One question about the baking powder… I did the 1 part baking soda to 2 part cream of tartar and the biscuits got a little crumbly towards the last few bite of the sandwich… no big deal at all. My question is have you ever tried using 1 part baking soda, 1 part cream of tartar and 1 part psyllium husk? I’ve read recipes for keto friendly baking powder that do it that way and I was wondering if you’ve tried that and if so what was your experience with it? Thanks for the videos and the recipes. Please keep up the fine work, it’s greatly appreciated! hey Steve, i have not tried that ratio of powder and husk, but its worth looking in to! Quick question for you. Which chicken sausage do you get from Trader Joes to make this recipe? Also you should do a do and don’t buy video at Trader Joes like you did at Costco! It was really helpful! Hi Phillip, I get the sun-dried tomato sausage from TJ. And, yes, I’m planning to do TJ haul very soon! Glad you enjoyed Costco! The Biscuits we’re tasty but crumbled right away I feel it needs glue xanthan gum maybe. You have great receipes on here. Thank you so much your time and effort is greatly appreciated. HI Gisela, thanks for the note! Yes, give it a try and let me know how it goes! I found if I cut back the butter by a couple of tablespoons and replace with cream cheese the biscuits will not be as crumbly. For the eggs, I suggest using a whoopie pie pan. It is perfect for diameter and a perfect height as well. I just mixed up 4 eggs and poured them into the pan just shy of filling it all the way. 350 degrees for about 15 minutes. Just made these sandwiches for the first time! 1. Biscuits- shockingly really good. 2. Sausage- So instead of buying sausages, I bought lean ground turkey and put my own spices together by using Mrs.dash garlic and herb and some chili powder. I also didn’t put cheese on it just because I’m trying to stay away from cheese. 3. Eggs- I have a fancy toaster that can actually make egg’s on the side so i used that per “egg circle” and I used egg whites instead of whole eggs. The sandwich is pretty delcious! I’m enjoying your recipes! Great job, Danielle! Glad you enjoyed!!! How many days till the buns keep? Hi Andi, the buns will keep up to 5 days in the fridge or 2-3 months in the freezer. Hoping I get a reply in time. I’m trying to understand the breakdown on these macros, so that I can plan my meals for the week. Your nutrition card says 6g net carbs for 1 sandwich, but the breakdown shows 3.5g net carbs for the sandwich and all of the components. Can you help me understand your macro breakdowns? Won’t be making the pudding, just the sandwich. Hi Lydia, if you want to make 1 sandwich, with top and bottom bun – this means 2 biscuits (the macros listed are for 1 biscuit) then add the macros for 1 serving of sausage/cheese/egg combo. I noticed you only listed the net carbs for the sandwich. Can you please provide the total carbs? Thank you! By the way, Angie – I sent the last one too fast and should have included this. These macros were recently updated however, I still need to update the actual blog where the old ones are listed. Question – Does the calorie count for one biscuit mean just one piece, or is that for a top and a bottom for the sandwich? They are delicious !! Janelle, thank you! Glad you enjoyed! The calories count is for 1 biscuit. For the biscuits, what is the ingredient that gives it the slightly bitter taste? Hi Alice, there shouldn’t be a bitter taste… you may want to check your almond flour – make sure it’s from blanched almonds. If it is a meal and has the almond skin that may result in a bitter taste. The eggs can make somethings taste bitter in my experience. So glad to hear it, Leona!!! 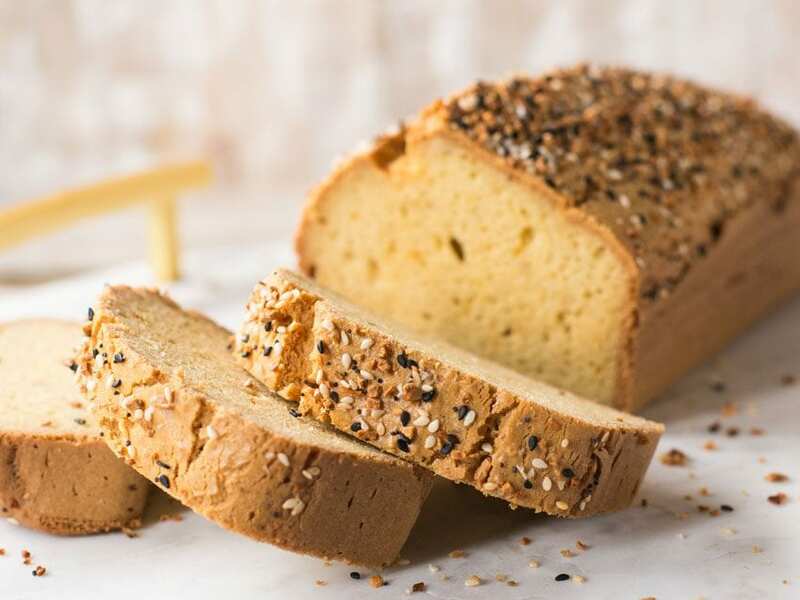 Have you tried my keto fat bread or the gluten free deserts on the blog? That was delicious! 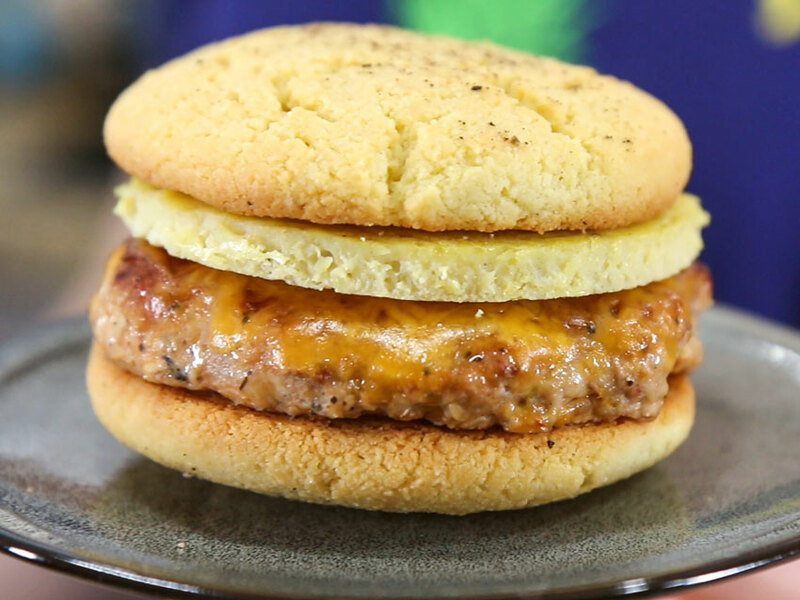 The best option for a replacement for one of my favorites: sausage mcmuffin with egg! Nicole, thank you, glad to hear it! Wow! This is a great breakfast recipe I meal prepped for my husband this week. I modified it slightly by adding cheese to the biscuit mix and he enjoyed it! Cheese makes everything better! Glad to hear! Hi! Love your recipes! 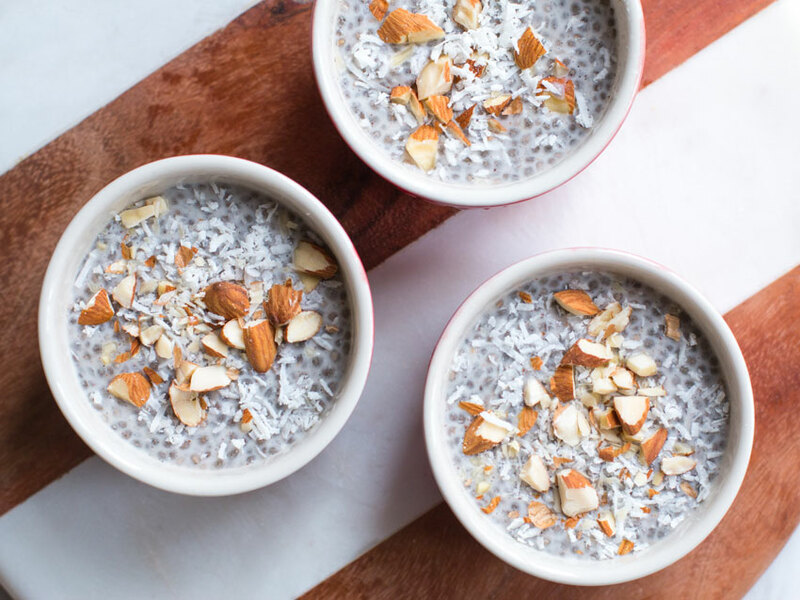 coconut chia seed pudding the best 😋 I love this in the morning, day snack or even as “dessert” in the evening. Delicious!! The almond biscuits turned out fantastic and they are surprisingly good! One question/suggestion, would it be possible for you to do a supplementary video on different ways to make chicken patties similar to videos for cooking chicken and steak in a variety of ways? I searched nearly every major store where I live and none had chicken sausage like he brand you bought for this recipe, so I used ground chicken instead. Great idea, Luke! I’ll diffidently plan on making a video about it. For this recipes I typically just buy chicken sausage and form that into a patty, it’s much quicker. But great job on making your own! Love that orange/red cast-iron pan you use to fry up the sausage. What’s the brand name?